Our recent Fun Challenge was a great success and all the Tigers and Dragons performed brilliantly. The competition was held in our dojang and the boys and girls competed in several events. Technical (punching and blocking), sparring, and we had a stretching event. Congratulations to all the boys and girls for practicing so hard and trying their best. Also a special thanks to the umpires who gave up their time to judge. There are some photos on the gallery. If any parents have photos of the night could they email them to Master Howard please. The Tigers are now in training for the Fun Challenge in Athlone on the 17th of April. Master Robert Howard VII was interviewed by the Irish Times for a special supplement on Science in Sport. 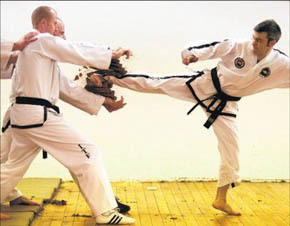 In the interview, which appeared on the February 16th issue of the newspaper, Master Howard (who is also a Doctor of Physics) explains the theory of breaking in Taekwon-Do. To read online, click here.